Our UberTimesheet solution can improve and expand your users' adoption of Workfront by making it simple and convenient for everyone to track time from their browser, tablet, or smart phone, after the fact. Our UberTimesheet solution can improve and expand your users’ adoption of Workfront by making it simple and convenient for everyone to track time from their browser, tablet, or smart phone, after the fact. 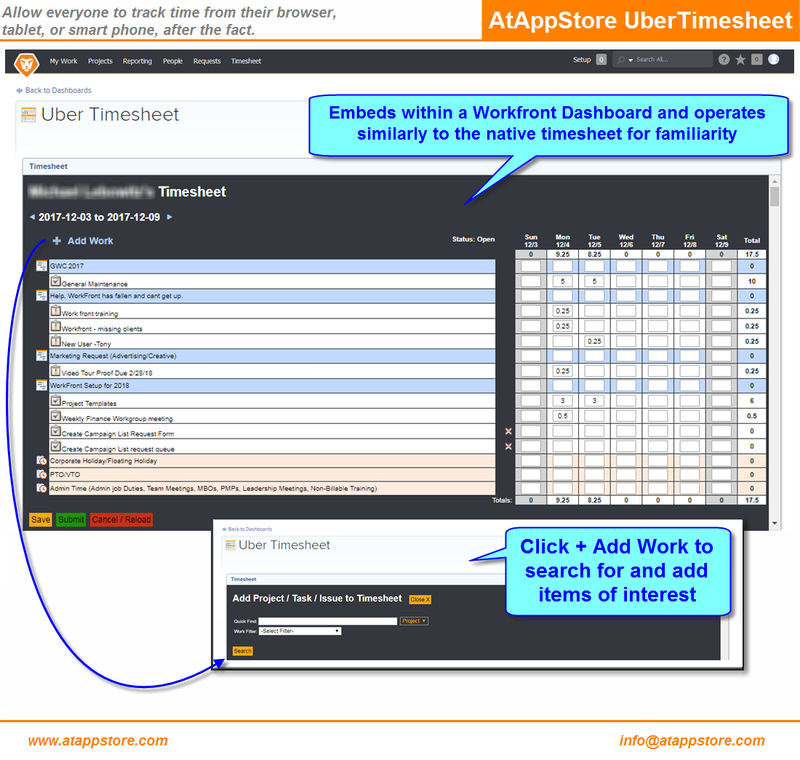 Our UberTimesheet is based on the same principals as Enterprise Stopwatch by extending Workfront’s reach and exposure for time entry to those extended parties that would not otherwise warrant a license (but ideally, converting them into real licenses over time) while simultaneously reducing the burden on PM’s who would otherwise have to proxy that time entry into Workfront. The obvious main difference between the two solutions is that UberTimesheet works best for time that is entered in bursts (e.g. “what did I do this week”), where Enterprise Stopwatch works best for that time that needs to be recorded alongside the work as it occurs (e.g. “what am I doing right now”). We invite you to trial our new UberTimesheet for 30 days to see if it’s a fit.